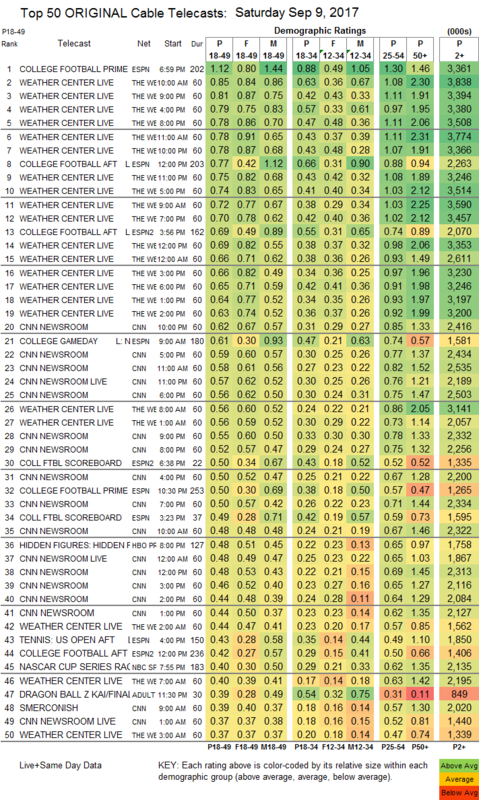 NETWORK FINALS: There were COLLEGE FOOTBALL games on 3 networks, and they adjusted as follows: ABC to 2.5, NBC to 1.1, and FOX to 0.6. 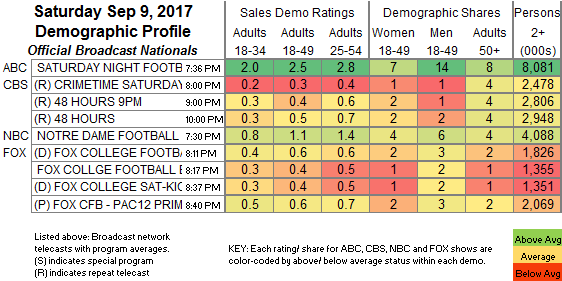 On CBS, the NCIS: NEW ORLEANS rerun lost 0.2 in final numbers, and the 9PM 48 HOURS dropped 0.1. CABLE HIGHLIGHTS: Saturday cable was all COLLEGE FOOTBALL and Hurricane Irma. ESPN’s primetime Auburn vs. Clemson game topped the night at 1.12. After that, though, 16 of the Top 20 slots went to segments of Weather Channel’s WEATHER CENTER LIVE, led by the 10AM hour at 0.85. CNN was also strong, as it usually is in times of natural disaster, with its highest hour the 10PM CNN NEWSROOM at 0.62. Adult Swim’s late-night line-up returned from a week off: DRAGON BALL SUPER at 0.42/912K (the primetime episode was at 0.30), DRAGON BALL Z at 0.39, JOJO’S BIZARRE ADVENTURE at 0.30, TOKYO GHOUL at 0.26, HUNTER X HUNTER at 0.26/553K, LUPIN THE 3RD at 0.23, NARUTO at 0.24/531K, OUTLAW STAR at 0.19/417K, COWBOY BEBOP at 0.17/374K, and ATTACK ON TITAN at 0.15/362K. On HGTV, HOUSE HUNTERS INTL rose 0.07 to 0.25, HOUSE HUNTERS gained 0.06 to 0.24, and BEACHFRONT BARGAIN HUNT was up 0.03 to 0.22. On Food Network, TRISHA’S SOUTHERN KITCHEN climbed 0.06 to 0.21, KITCHEN AT FN rose 0.03 to 0.20, , and PIONEER WOMAN was up 0.06 to 0.19. ID’s SWAMP MURDERS ticked down to 0.20. AMC’s HALT & CATCH FIRE returned from a Labor Day break at 0.13.